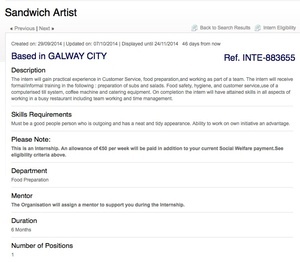 Posted in Misc and tagged JobBridge at 11:22 am on October 8, 2014 by Broadsheet. Which one? Dont be Tuam Rd!!!!!!!!!!!!!!!!!!!!!!!!!!!!!!!!!!!!!!!!!!!!!!!!!!!!!!!! Ah here, It’s a golden opportunity, do it for a few days, then a week on the board of Imma, then off to the Seanad and a lifetime pension. The only way is up. Only ever used it cos they had pickled gherkins. I’ve reported quite a few of the janitor, shelf-packer and dishwasher jobs. Be calm in your complaint, no hyperbole, it’s not the place to mouth off. “Please can you bring this advertised position on JobBridge to the attention of Joan Burton for what I believe to be an abuse of the JobBridge scheme, thank you. There is nothing to be gained from 9 months as a kitchen assistant, nothing. It’s an abuse of persons looking for real jobs to allow a 9 month internship on a job that can be learnt in a day. It’s disgusting and degrading to those already working in such a position. Please advise on what will be done to have this abuse removed asap. If it is deemed to be not an abuse, I want to be told a detailed reason why. Finally, what will be done to prevent these abuses in future. I have received responses to all complaints. Now, some might say, a response means nothing, but I say it means they cannot deny it and the more we point out the abusers the better for everyone. Not all JobBridge schemes are pointless, we’ve used it twice and employed the persons within the first three months once we knew they were capable of continuing the work. Is Dermot Lacey your representative or has he something in particular to do with JobBridge? Just wondering why you say to send it to him. I originally sent my first complaint to Joan’s own email address. She has her ‘people’ respond I guess, which would be expected. Most of my correspondence has been with Dermot. I have also got responses from Pat.Dunne@oireachtas.ie …but mostly Dermot. Fair play to you Clampers, however you can forget about that Senate seat you were hoping for. I wrote to Joan last year with very specific and reasonable queries and concerns about the jobbridge scheme. I got some drivel for a response, basically outlining the basic details of the scheme and not addressing a single issue that I had raised. When I responded by outlining that they failed to address the issues raised and requesting that they do so, they sent me an almost identical response. I gave up at that point, realising that these people have no respect for the public whatsoever. I’d rather stuff like this stayed up to ultimately y discredit the whole idea of jobbrisge. wonder if they learn to make bread using azodicarbonamide? Another poor soul off the live register…… quick Enda quick, adjust the figures! The youth of today have absolutely no future in this country. I don’t understand how jiobs like this are being posted? Is there no quslity control or pre-approval prcoess before an “internship” is posted? I agree with job bridge as an idea but even after a number of years and a tonne of negative publicit it is still being abused. Which is disappointing. 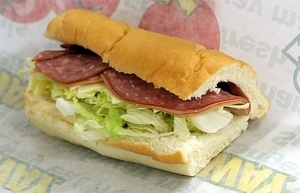 It’s also wirth stating that Subway’s Southwest sauce is fantastic. It probably seemed like a very hard and complex job to the HR numpty that decided to put it up. though seriously its probably just more cronyism. 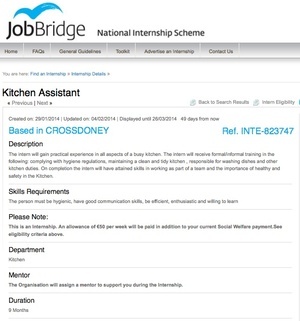 we really need to looking into who is moderating and approving these “internships” and how close they live to Enda. Baffles me too, would not be too difficult set it up so that all posts to it have to be approved and I can’t imagine it would take more than one person two max to monitor, but thats common sense so it will never happen. All postings do have to be approved. We have had one in for the last week, still waiting for approval from them and for it to be posted. So someone, a human being, is looking at them and saying that’s ok.
And before anyone goes off on me, we have employed the person we last had on Job bridge, and we take the mentoring / training part of it seriously. I would be embarrassed to have anyone in just to stack boxes or fold clothes and then say cheery-bye. Lots of people out there do want experience and they have to get something out of it as well. Wow medal for you. You got the state to pay the first 9 months of a meagre salary for your staff. what if you really wanted to get experience in an industry and were willing to work for free to get it? Well, people have been doing just this for years – it’s called an internship. People were even working for free during the boom to gain experience , it’s common. Job bridge let’s you do that AND keep your job seekers allowance, evern though you’re not technically job seeking. This, most would agree, is a very positive thing. Sounds like Maccers Co and now full time employye embraced it and both benfited. Dunno how you can talk that down. How do you know Maccers’ company kept them on for nine months at the JobBridge rate. We didn’t…. they were hired after three. I am actually confused about what people want? Is the only option for someone who was, for example, in the building or service industries and have re-trained in IT (so they have no experience in the area) to emigrate or sit on the dole? I personally have severe reservations about Job bridge but in all this debating about it, I am not seeing any real suggestions bar slagging it off. The best advice has been from Clampers Outside above about reporting blatant abuse; tighten up the scheme, make it worthwhile and there is a benefit to some. There is no way someone who has been a builder for 15 years and then done a six month course in networking is going to get a network engineer position without real world experience. The only other feasible new thing I have seen come up recently is the IT apprenticeship which runs over 2 years. With an estimated 7000+ jobs open right now in the IT industry in this country, and only 25% of them for expert level, how are people going to get into it when they are not in a position to do a degree course for four years and even that would be overkill for positions that are available right now? I am not associated with this report but it was passed to me and it makes interesting reading if you are bothered. have sent email to that contact in the Labour party complaining about it. Looks like they need someone with creativity to be fair. That sandwich above looks rank. For blokes from the country up in Dublin working in insurance who have hangovers Wednesday, Thursday and Friday mornings. Then they head off home to Mammy and the local disco for the weekend and eat in Supermacs at 3am while trying to get the shift from Claire who is studying teaching in St. Pats.